We heard about “tiny houses” several years ago, and since then we’ve been intrigued by the idea of simplifying our lives, living with fewer possessions, and being free to travel (or not) as YHWH directed. When Kraig resigned from the pastorate in early 2013, we prayed about moving into an RV or tiny house then, but YHWH shut the door firmly. He planted us instead in Spring Valley, Wisconsin, where we’ve enjoyed the blessing of a beautiful 2400-square-foot rental home nestled in a wooded valley that feels like it’s in the middle of nowhere but is a short drive from the Twin Cities. It’s been a year filled with transitions, new occupations, and many opportunities to trust YHWH — so this quiet retreat was probably exactly what we needed! However, since the beginning of 2014 we’ve felt as if YHWH was changing our course. We just didn’t know how! We prayed about many possibilities and sought advice from close friends. If He would have told us at the beginning that this was how He was leading, we would surely have been terrified! Thankfully, He leads slowly, one day at a time, gently guiding and directing. When He planted the idea that maybe now was the time to leave our home and start living on the road full time, He quickly answered specific prayers and provided confirmation in numerous ways. The final piece, after we had announced our intentions to indeed move out of our home, was when we found out that our landlord intended to list our home for sale. We indeed must move! 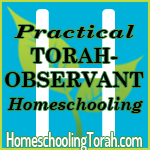 Because we write curriculum for HomeschoolingTorah and because we design websites, our jobs are based entirely online. So we’ll pay the bills the same way we have in the past — by working “from home” and trusting YHWH to supply. Our lease expires the end of May. We’re going to be doing well to have all our stuff sold by then and to be ready to leave. If we purchase a bus, we’ll spend the first several months working to convert it into a home. We probably won’t travel too much while we fix up the bus. Rather, we are lining up the help of friends and family to help us get started. Are you going to tow a car? We’re planning to! We won’t want to “break up camp” just to get a gallon of milk. 🙂 We’ll see exactly how YHWH supplies. Our desire is to be somewhat flexible, so that if YHWH brings a need into our lives, we can be free to pick up and go to help meet that need. However, during the first several months, our desire is to visit family that is spread across this country, whom we haven’t seen in many years, before our children grow up any more! As we travel, we hope to visit Messianic congregations on Sabbaths to encourage them, visit friends we’ve only “met” online, and be a help in any way we can. You can subscribe to our blog updates to hear about our travels as we go. If you’d like for us to visit you as we go through your state, contact us and we’ll pray about it. Yes take pictures as you remodel, stop in if you come this way, take pictures of your travels and you are in our prayers. No wonder you and my Cathy got along so well. The four of them lived in a little travel trailer for quite a while. Exciting. We will praying for you all. Sounds exciting and scary all at once. I hope your planning to come our way!!! We would love to see you and meet the kids! Can’t wait to see you, too! I’ll be praying for you that everyting works out for you, and I hope to see you sometime. Yes sounds scarey and exciting all at once. We would so love to see and meet all of you. Hopefully you can post an itinerary – then if you are close by maybe I can try to meet up with you to see you! May God bless you with safety on the roads!!! Oh, we would love to see you! ♥ We’ll do our best to keep everyone updated about where we are. I would guess we’ll be coming through your neck of the woods at least a couple times this summer, though. We will pray for you. I am sure that GOD will lead you. He promised us that HE will never leave or forsake us. How do the children feel about the adventure you will be embarking on? I hope to see you when you are in our area. Thank you! I love that verse. The kids are all quite excited about it. Of course, right at the moment, in the middle of packing, we’re all a little tired. But this will pass soon.